The big Portland cement company reduces production costs by burning cheap urban waste as do other cement companies in Spain. The city council orders air quality study . 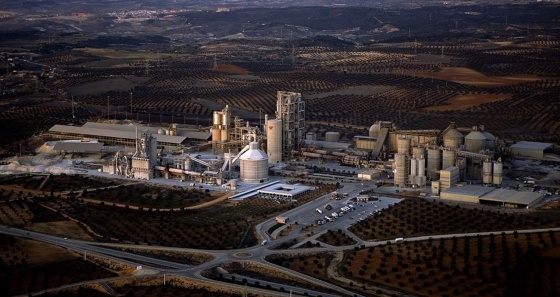 The cement plant Portland Valderrivas in Morata de Tajuña is the biggest in Spain and one of the biggest in Europe. In late 2012, very possibly as a result of cost-saving measures due to the steep decline in cement production in Spain since 2008 (linked to the bursting of the absurd building bubble), the company asked permission to change or supplement the fuel they were using. From petroleum coke they would change at least in part to different sorts of waste (which may include tyres, plastic materials, meat and bone meals, sewage sludge and domestic waste). The company got the permission to use co-incineration during summer 2013. This is a new instance of what has happened elsewhere, in a location about 35 km to the south of Madrid not far from the domestic waste incinerator of Vandemingomez. As in similar cases in other countries and in Spain, opposition has appeared against this project at local and regional scale, defining it as an environmental justice conflict. As reported in the newspaper El Pais (21 May 2013), the neighbours, the vecinos, are opposed: "La planta ya quema pulpa de madera pero está a la espera de que la Administración autorice la sustitución parcial del combustible fósil por residuos, como harinas animales, lodos de depuradoras y neumáticos que de otra manera acabarían en el vertedero. No obstante, los vecinos se oponen y aseguran que la quema de basuras en incineradoras pone en riesgo la salud." The greatest concern of these groups are the alleged negative potential consequences for human health and the environment related to the uncertain risk of toxic emissions produced in the chimneys of the industrial installation. Several petitions and street protests have been organized; these groups are also coordinated with other national and international groups working against waste incineration. The Diagonal journal reported in June 2013 this statement from Lorenzo Mora Martínez, president of the Asociación de Vecinos de Morata de Tajuña: "Los vecinos del municipio nos oponemos a esta incineradora y a la quema de estos residuos porque va a provocar unos efectos muy graves sobre la salud”. Although the company has assured all measures have been taken, data produced by the the municipality talk about an increase of dioxins and furan by 729,54% from previous year and that heavy metals increased by 15,49% . Nevertheless, the permits seem to have been granted in summer 2013 by the environmental authorities of the Community of Madrid. The cement factory itself (belonging to FCC) is reported to be in a financially precarious situation. We have here a case whether an environmental conflict does not arise from an increase in the social metabolism of the economy but on the contrary, lack of demand for cement is leading to cost-saving measures (with perceived new environmental risks and also labour unrest). It was announced in 2014 that the Spanish Platform against Co-Incineration of Waste in Cement Factories would have its fifth meeting on March 8/9 in Morata de Tajuña. For environmentalists such as Ecologistas en Acción, who endorsed the meeting, burning waste for fuel is not a good idea. They claim that producing less waste and recycling it is preferable, it would save more energy than is produced by (riskily) burning the waste. In November 2014 Ecologistas en Acción and the Asociación de Vecinos de Morata de Tajuña filed a complaint before the Superior Court of Justice in Madrid against the modification of the environmental permit granted to Portland Valderribas. The procedure is still going on in 2016. Development of Alternatives Better waste management. Towards a Zero waste policy. Why? Explain briefly. The company got the permission to use co-incineration during summer 2013. The population of Morata de Tajuña was divided in opinions regarding the incinerator. There was a strong social pressure not to jeopardize jobs. That also made difficult to communicate environmental concerns. Ley 16/2002 de 1 de Julio de prevención y control integrados de la contaminación. Ley 22/11 de 2011 de residuos y suelos contaminados. Directiva 2008/98/CE del Parlamento Europeo y del Consejo sobre los residuos.